April 17, 2009, Greencastle, Ind. 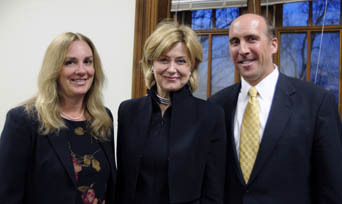 — [Download Video: "Playing it Straight" - 1311kb] "One way the news media can get its niche back is to get straight again," award-winning journalist Jane Pauley told an audience at DePauw University tonight. Delivering the keynote address at the 100th anniversary celebration of the Society of Professional Journalists (SPJ), which was founded at DePauw, Pauley lamented the fact that the line between news and entertainment has blurred in recent years. "When you're competing with entertainment programs, well, the entertainment programs are probably going to do better. So, if you do what they're not doing, reliably and well," the results may be positive. 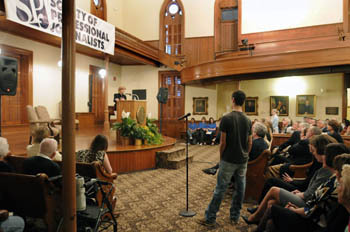 Pauley told the audience gathered in Meharry Hall of historic East College -- just up the stairs from where SPJ was founded as Sigma Delta Chi in 1909 -- [Download Audio: "Not Optional" - 324kb] "I depend on the NewsHour on PBS. I pray that Jim Lehrer lives forever, because what they do is journalism, and in broadcast journalism it is, in my opinion, the absolute best and I absolutely depend on it. I gotta say the network shows are, to me, I watch them but they're optional. The NewsHour is not optional." The winner of multiple Emmys and the Edward R. Murrow Award for her contributions to journalism, Pauley delivered a humorous and insightful look at a broadcast career that began in meteoric fashion and was the result of, in her words, "luck and timing" more than anything else. She described growing up in Indianapolis, and said of her father, "We both delivered the news. He had a paper route." In high school, Pauley served on the debate and speech team at Warren Central High School, and was the state champion girls extemporaneous speaker and governor of Girls State. 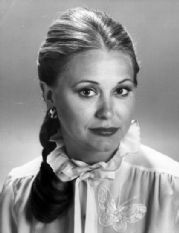 She graduated from Indiana University in 1972 with a degree in political science. After a brief and unsuccessful stint selling encyclopedias, Pauley went to work for Indiana's Democratic State Central Committee. One day a reporter from Indianapolis CBS affiliate WISH mentioned that the television station was looking for a female reporter. [Download Video: "The Right Time" - 1400kb] "Not born too soon, not born too late. 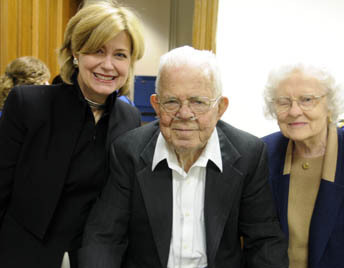 Born just in time," Pauley told the audience, which included DePauw students and faculty members, citizens of Putnam County and journalists from around the country who gathered for SPJ's birthday. "1972 was the year the FCC added two words to the affirmative action clause pertaining to station licensing. Two words -- 'and women.' The building blocks of a career were falling into place. Right time, right place." Pauley landed that job at WISH and spent three years at the station, then briefly worked at WMAQ-TV in Chicago before NBC and Today came calling. She went from anchoring the weekend news in Indianapolis to a prime spot on the peacock network in a year's time. [Download Video: "Pioneers" - 1421kb] "I was not a pioneer in broadcasting like Barbara Walters and her generation," Pauley noted. "Though Barbara has said that, of all of us ... 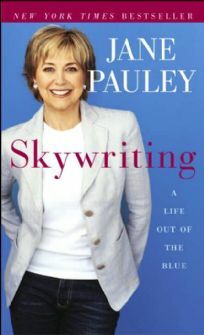 I'm -- Jane Pauley -- I'm the only one who really had it all, which I think is pretty ironic because in my day I was a big having it all debunker, unless having it all meant guilt, burn-out and stress." Pauley noted how different the world was when she joined Today. [Download Audio: "Firsts" - 612kb] "A generation ago, women appearing on TV every day -- whether on the morning shows or on local anchor desks -- working side-by-side with men in a professional setting, we reflected changes, dramatic changes going on in society. We all covered the first women this-or-that. I personally covered the first woman on a presidential nominating ticket, the first woman astronaut, the first woman driver at the Indy 500, the first woman jockey, probably the first woman bank robber. We did a long list of firsts." She added, "I think I was the first Baby Boomer on a network anchor desk ... and now, where are the Baby Boomers on the anchor desks?" Within a few years, ABC's Joan Lunden was pregnant and Pauley, who was carrying twins at about the same time, "trumped her," she recalled to laughter. "Before my generation, you wouldn't say pregnant woman on television, much less be one," she declared. [Download Video: "Accelerating Change" - 1533kb] "But more than reflecting change at that time, I think that all of us -- women anchors, reporters, mostly young women on television -- probably accelerated the change that was going on," Pauley recalled. 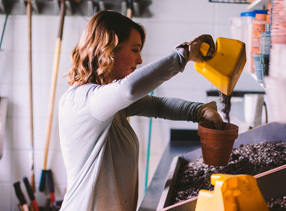 "We made working, and even working while pregnant, look normal and probably helped it to become the norm, and all while doing what just came naturally. And for that I'm celebrated," humbly added the woman who was called a "journalism pioneer" by Walter Cronkite. 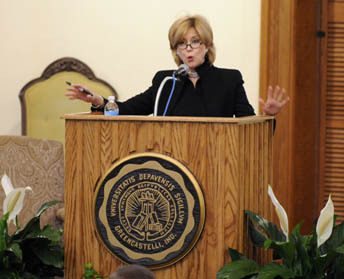 Jane Pauley served as co-host of Today until 1989. 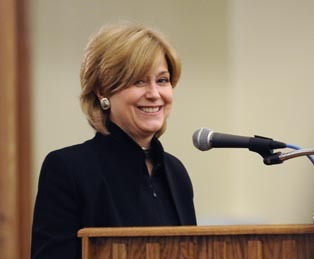 Her lengthy resume also includes serving as weekend anchor of NBC Nightly News (she also served as Tom Brokaw's primary fill-in on that broadcast), and hosting Dateline, Real Life with Jane Pauley, the Jane Pauley Show, and Time & Again, a retrospective news program which aired on MSNBC. She has been honored with the Radio-Television News Directors Association's prestigious Paul White Award for her lifetime contribution to electronic journalism, as well as the Leonard Zeidenberg First Amendment Award. She was also awarded the first national Matrix Award from the Association for Women in Communications, the AWRT's Gracie Allen Award for Outstanding Achievement by an Individual, and was inducted into the Broadcasting and Cable Hall of Fame in 1998. Pauley has also been the recipient of a Clarion Award, a National Press Foundation Award, a Gabriel Award, a Nancy Susan Reynolds Award, a Maggie Award, a Wilbur Award from the Religious Public Relations Council and a Salute to Excellence Award from the National Association of Black Journalists. She was named Communicator of the Year by the National Forensic League, was honored with a Living Legend Award by the Indiana Historical Society and was inducted into the Indiana Broadcast Pioneers Hall of Fame in 2006. Tomorrow, she will be inducted into the Indiana Journalism Hall of Fame at a luncheon at DePauw's Walden Inn. Professionally, Pauley was always viewed as -- in her words -- "famously normal." But in 2000, while on a sabbatical from NBC, she was diagnosed with mental illness after medical treatment for hives triggered a previously unrecognized vulnerability to bipolar depression. She wrote about it in 2004 in her candid bestselling memoir, Skywriting: A Life Out of the Blue. [Download Audio: "Important Storytelling" - 280kb] "Being able to tell my story has been a blessing for me, and I hope it has helped move the conversation about mental illness in a direction it was already rapidly moving toward -- toward knowledge and insight. Mental illness is a treatable illness and mental illness is a medical illness." Pauley added, "I hope to find new ways to tell to stories, but I don't think I ever told or will ever tell a story more important than the one I told about myself." The business of journalism is in flux, to be sure, and these are difficult days for news operations, the Ubben Lecturer noted. When she was an upstart in the television business, Pauley recalls considering what TV's early days were like and [Download Video: "We're There Again" - 1108kb] "thinking how great it would have been to have been at the beginning when visionaries were inventing the industry. We're there again. New things are happening, the old model is not gonna be there. But you are the dawn of something," she told the student journalists in the audience. 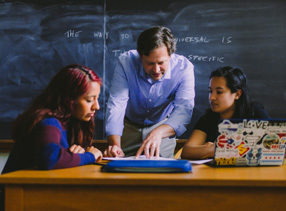 [Download Video: "Creating the Future" - 2442kb] "You're at DePauw so you're getting a really good and expensive education," she noted with a chuckle. "But just be really serious about your education, your knowledge, because when you leave here and are looking for a job in broadcasting, journalism or whatever it is, the thing you can't miss with is being smart and literate. 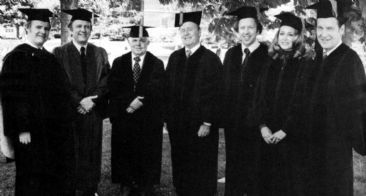 So bear down, focus on your studies, on your grades and then you'll be ready when you and other people like you invent the future which I will not be a part of," Pauley said to laughter, adding, in her best Dateline voice, "because I'm history." She declared, [Download Video: "Greencastle Memories" - 1933kb] "I have never come to Greencastle, and I have been here many times, on anything but an auspicious occasion," Pauley asserted. 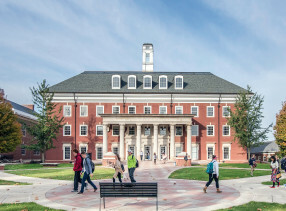 "I am fairly confident that my first assignment [as a WISH-TV reporter] was here at DePauw to cover the opening of the brand-new science center, which, by the way, I thought was holding up pretty well in middle age but I hear it's had some work done." 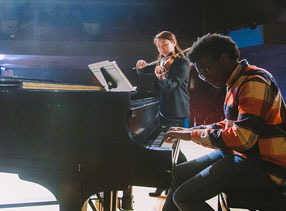 Dedicated on September 30, 1972, the Percy L. Julian Science and Mathematics Center was expanded and nearly doubled in size for a 2003 rededication. Another child, Thomas, was born in 1986. Rosser was DePauw's 17th president. 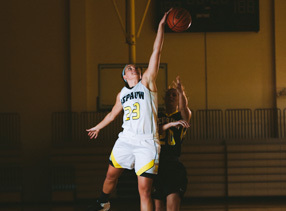 [Download Video: "Another DePauw President" - 1836kb] "My daughter flew out to Indiana from New York and was on stand-by with another guy that got on the plane and they were lucky to get the two back seats," Pauley recalled. "And it turned out your brand-new president was her seat mate on a flight to New York. I picked her up at the airport in Indianapolis, she just, 'Na na na na, coolest dude in the world' ... She doesn't get excited like that, a pretty laid-back cookie but very, very impressed, and I'm fairly impressed myself," she said with a sly grin. 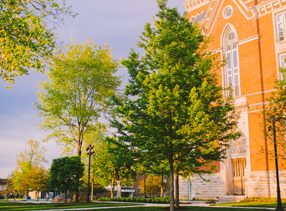 The veteran journalist admitted to spending time on another area of the DePauw Web site. [Download Video: "The Ubben Roster" - 1222kb] "I realized looking with some intimidation at my predecessors here at the Ubben Lecture podium, a frightening group of people" which include Tony Blair, Benazir Bhutto and Mikhail Gorbachev, "I had met or interviewed more than half of them." Said Pauley, who admits to having a poor memory when it comes to details of her career highlights, "And I mention that in the sincere hope that there will be no follow-up questions," she said as the crowd laughed. 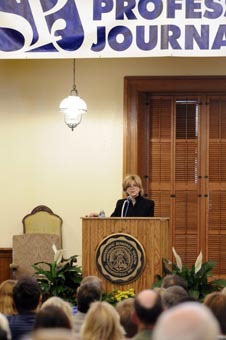 Jane Pauley's address, which received several standing ovations, capped a day of events which included a presentation by Richard J. Tofel, author of Restless Genius: Barney Kilgore, The Wall Street Journal, and the Invention of Modern Journalism; a panel discussion featuring journalism notables such as XM Radio's Bob Edwards and Ken Paulson, who leads the Freedom Forum and Newseum; and a celebration dinner. A full summary of the day's events can be found in this previous story, and an archived webcast will be available soon. 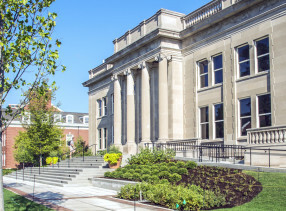 On May 6, 1909, a story on the front page of The DePauw Daily announced that ten DePauw University student-journalists had formed Sigma Delta Chi, a journalism fraternity. Now known as the Society of Professional Journalists, it is the nation's most broad-based journalism organization. 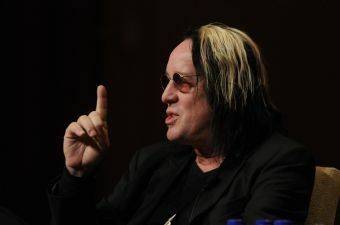 Established in 1986 through the generous support of 1958 DePauw graduates Timothy H. and Sharon Williams Ubben, the Ubben Lecture Series welcomed musician and innovator Todd Rundgren (pictured at left) last week. David Plouffe, Barack Obama's presidential campaign manager, visited the Greencastle campus in February, just thirteen days after the inauguration. Greg Mortenson, author of Three Cups of Tea, was a Fall 2008 guest. To view a complete roster of Ubben Lecturers -- which includes links to video clips and news stories of speakers such as Margaret Thatcher, Peyton Manning, Naomi Wolf, Jesse Jackson, General Colin Powell, Doris Kearns Goodwin, General Wesley Clark, Elie Wiesel, Spike Lee, Mitch Albom and Benazir Bhutto -- click here.